Fortaleza Cosy corner connects the other modules to a loungeset. This Taste by 4 Seasons corner comes in color roca wicker with three all weather cushions. Fortaleza Cosy corner Roca wicker. Fortaleza Cosy corner connects the other modules to a loungeset. 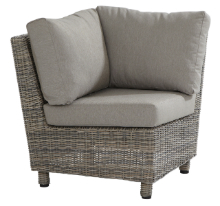 This Taste by 4 Seasons corner comes in color roca wicker with three all weather cushions. On the wicker weaver, you get 3-year warranty on color. On the other components you also get a 3 year warranty. Combine this Taste corner with one or more of the other 3 elements of this Taste series.